Wood is having a resurgence in architecture with more and more people choosing to use it as a construction material. A growing number of houses and buildings opt to use wood in unconventional applications, lending warmth and personality to these structures. This interest in wood also comes with a growing consciousness for the environment, as wood is, hands down, the most ecologically-viable of all construction materials. Though wood is making headway outside our homes and offices, the interior is an altogether different subject. The predominant aesthetic trend favors materials such as steel, glass, marble, and ceramic products. What many fail to see is the fact that wood is charming, functional, and most importantly, timeless. It also gives off that Scandi vibe that’s becoming popular in design circles. The Washington SyCip Park and the Legazpi Active Park are Now Open! Months after the Washington SyCip Park and the Legazpi Active Park in Makati’s Legazpi Village closed for renovations, the two landscapes have now been reopened for city-dwellers and people looking for shade amidst the buildings and skyscrapers. OPPEIN, Asia’s Largest Cabinetry Manufacturer, Opens its First Showroom in Manila! I used to love playing The Sims. The game where you can play God and control every aspect of your characters’ lives took over my teenage life and I would spend summers doing nothing but play. But while I enjoyed controlling my Sims, my favorite part of the game was designing the homes. My obsession with creating perfect homes extended into adulthood and I’ve become a fan of great architecture and interiors. Manila is home to beautiful homes and boutiques, and it’s because of the access we have to talented and homegrown designers, as well as imports from the design capitals of the world. There’s now a new addition to the bunch as OPPEIN, Asia’s largest cabinetry manufacturer, opened its first Manila branch. One of my greatest luxuries is going on a hotel staycation. It’s like leaving your ordinary life behind and stepping into a world where you can walk to your favorite shopping destinations, order room service, have a great view of the city, and have a heater in the shower. Some of my favorite assignments are staycations (travel, too, because it means holing up in a five star hotel), and I go on my own dime every now and then. 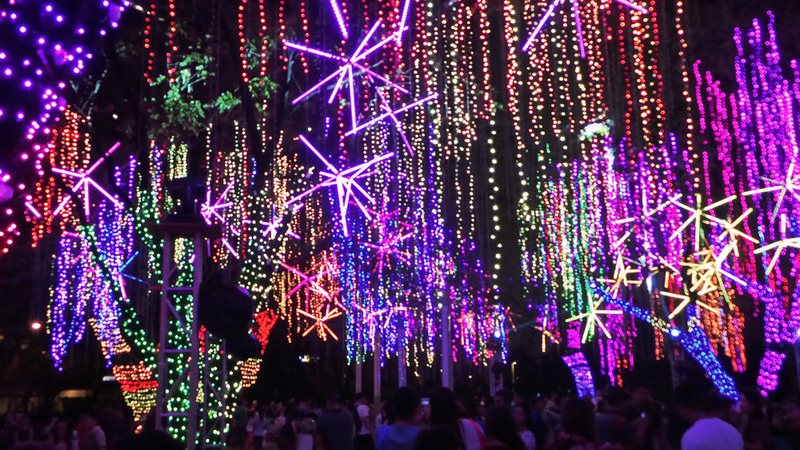 I’ve known about the Ayala Triangle Garden’s Lights and Sounds Show for a while now, but I haven’t been there yet. So when Conde Nast Traveler recently announced that it’s one of the seven most spectacular places to see Christmas lights around the world, I decided to check it out this year.